Because this is the blog's 10th Anniversary year and the picture is so appropriate for the season, here is a re-run photo used in our very first Full-Time Life post around this time of year in 2007. In most parts of the USA, 'Fall' is the word for the season between Summer and Winter. I actually prefer to use 'Autumn' .... but 'Fall' is funnier. The next two pictures are also old because we don't have much Autumn color here yet. The one above is in the Ozark Mountains, on a different trip. Instead of beautiful colors, the last week of summer here in Eugene brought rain and for that we are beyond grateful. The moisture has cleared the air of wildfire smoke that permeated the Willamette Valley for much of September. We hope for continued rain and snow in the mountains because it is needed to put out all of the fires completely. I will not even think of complaining about rain this year! The marigolds and matching butterfly are also from the Vermont trip. I could pretend it was more recent, because it could be from an Oregon flower bed -- or lots of other places -- but we don't believe in fake news or fake pictures around here. The sculpture of Rosa Parks waiting for the bus (and for her place in history) is appropriately situated on the plaza in front of the Lane Transit District terminal, just a few blocks from our apartment. People love to give her flowers -- she is almost always holding a fresh bouquet. The pictures on the right are flowers (and a few things to eat) purchased at the Saturday Farmer's Market. We don't have to worry about parking, because the Market is also within very easy walking distance. OUR WORLD on Tuesday; MOSAIC MONDAY; NATURE NOTES; ALL SEASONS; THROUGH MY LENS; TUESDAY TREASURES; FLORAL BLISS; WILD BIRD WEDNESDAY; SIGNS SIGNS; SKYWATCH FRIDAY; SATURDAY CRITTERS; RATHER B' BIRDING and THE BARN COLLECTIVE. Thank you to all of the hosts! We are enjoying life on beautiful Martha's Vineyard -- and only about three states behind in posting about our road trip. This is a repeat picture from another trip, but appropriate for this first day of Fall. Back to the road trip soon. This picture is from our trip to Vermont, in 2003. It was our first RV trip to the East Coast and we loved being leaf-peepers. Bill had taken a fairly serious fall off of a barn (in Oregon) not too many years before this trip. It happened in November and we'd heard quite a few jokes about the Fall Season. 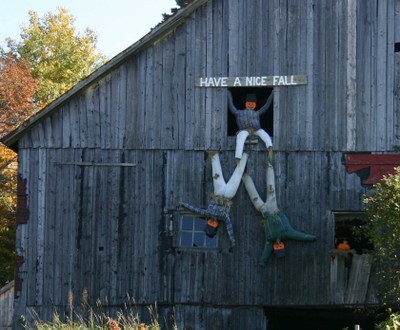 So when we spied this Halloween decoration along a country road, it struck a wryly funny note. Fortunately (I think), Bill fell on his heel, not on his head like these guys are about to do. 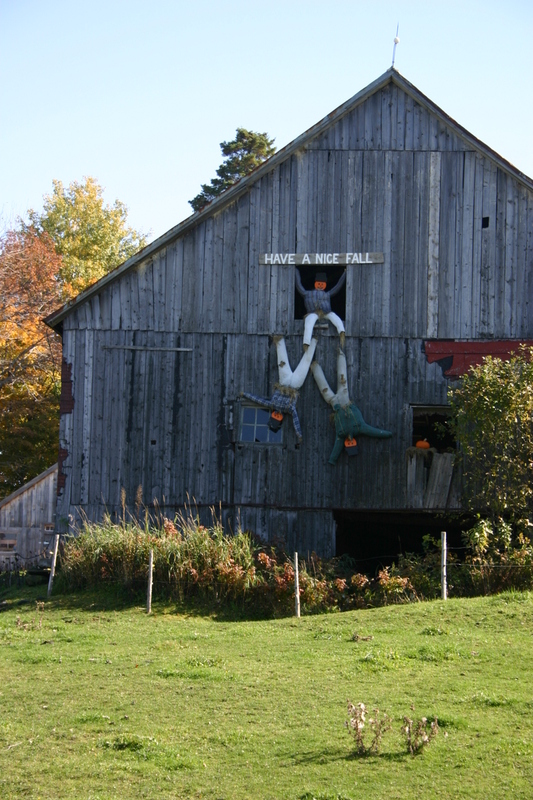 Here are some pictures of Vermont's beautiful fall scenery. Click on the thumbnails to see a larger image. We stayed at Sugar Ridge RV Park, which is between Danville and St Johnsbury. One week during leaf season, all of the little villages in this area take turns hosting a fall foliage event. It's a great way to get to know local people as well as to learn about their historical towns and (not least) to share their delicious food. This is the Goodwillie House, in Barnet. It was built in 1790. Thresher's Mill , a restored grist mill. The town of West Barnet held a European coffee hour in this old church on the afternoon of their festival day. They served every kind of baked goods and tea-time treats imaginable. We sure didn't need any dinner that day.